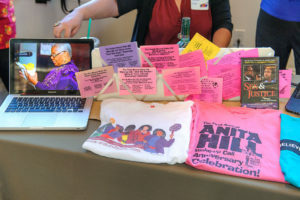 Help Build the Anita Hill Party Archive! The official Anita Hill Party Collection will be joining other collections of papers by and about organizations and individuals in South Carolina history. It is available for use by researchers wanting to know about women and women’s issues in this state. It will be there hereafter as evidence of the concern we all share about the important issues that Anita Hill stood up for and we all stand for today. If you would like to see the collection, it is displayed in the Hollings Collection at Thomas Cooper Library as part of the South Carolina Political Collections (SCPC). Material is being collected by a History Committee chaired by USC History professor Marjorie Spruill and can still be donated to the collection. Have something to contribute? Clippings, photos, invitations, mugs, buttons, banners, T shirts? Didn’t save any items but have some great memories or thoughts to share? Write them down and donate them! When did you start coming? Why? Why have you kept coming? In other words, tell us about why the Anita Hill Party has been and is now important to you and to others. Your stories, long or short — whatever you want to say — will be a valuable addition to the archive. Donation Form: The South Carolina Political Collections will need each person donating material to fill out a donation form that will be signed and returned to you acknowledging receipt. If you would like to fill it out in advance and send it with the items you are donating (which would be very helpful). Download the donation form here.